Zone 1 and Zone 2 isolators (switch disconnectors) are ATEX certified for hazardous area installation - Craig & Derricott range of ATEX certified Zone 1 and 2 isolators are housed in heavy duty cast enclosures for use in hazardous areas. Zone 1 and Zone 2 isolators are available with 16a, 25a, 40a, 63a, 80a, 100a, 125a, 160a, 200a, 250a current ratings for hazardous are electrical installations. High quality heavy duty cast electrical enclosures are used throughout the hazardous area isolator range - Zone 1 and Zone 2 cast iron isolators 16A-80A, cast aluminium isolators 63A-250A. The electrical enclosures housing the hazardous area ATEX certified isolators (Zone 1 and Zone 2) are supplied with large cable entries which can be fitted with approved hazardous area reducers to suit cable requirements. All load switching interiors of the Zone 1 and Zone 2 isolators are supplied as either TP&N (switched neutral) or 6P and have AC23A ratings to BS EN 60947-3. Craig and Derricott isolators (switch disconnectors) are housed in heavy duty cast iron enclosures - ATEX certified electrical equipment for use in Cat II, Zones 1 & Zones 2 hazardous areas. High quality heavy duty cast enclosures are used throughout the hazadous area isolator range - cast iron 16A - 80A, cast aluminium 63A - 250A. 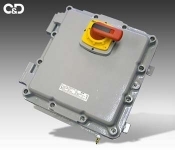 The electrical enclosures are supplied with large cable entries which can be fitted with approved reducers to suit individual cable requirements. Specific cable entry requirements can be accommodated - please specify when ordering. All load switching interiors are supplied as either TP&N (switched neutral) or 6P with AC23A ratings to BS EN 60947-3. Auxiliary contacts are available for applications such as SCADA packages. Operating handles are capable of accepting up to three padlocks in the ‘Off’ position.